Oy, Peet . . . what a day indeed. 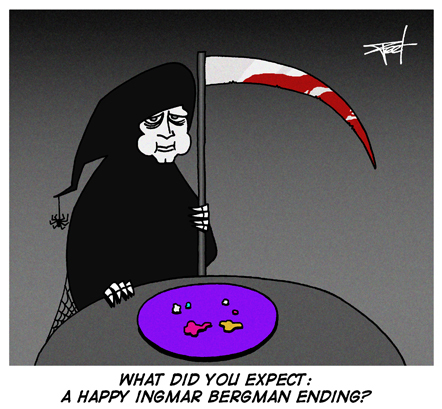 And so soon after Bergman’s bleak birthday, too. But I’ve had a very entertaining time reading all the give and take over the past week about Bergman … I think that most comments about his artistry or his body of work are much too early, especially since that body of work has just now been closed. The hell of it is, because both he and Antonioni died the same day, they’ll be linked for some time to come, compared in a very artificial way . . . I like it that most critics, for instance, follow the party line that Antonioni is the giant . . . I wonder if 50 years from now it’ll be the same? Anyway, comparing the two is very good for readership at the moment, even if it is a trumped-up exercise in apples and oranges.